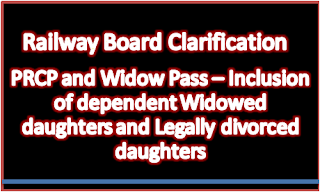 Sub: CIarification regarding inclusion of dependant “Widowed daughters” and “Legally divorced daughters” (LDD) in ‘Post Retirement Complimentary Pass’ (PRCP) and Widow Pass. Ref: Board’s letter No. E(W)2002/PS5-1/8 dated 16.04.2003. 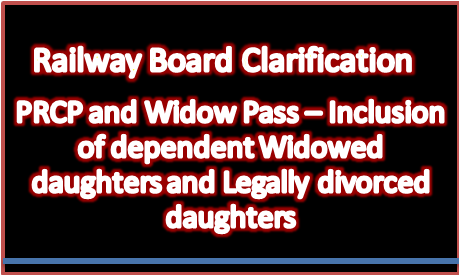 Clarification has been sought by two of the Zonal Railways, ie Eastern & South Central Railways regarding inclusion of (i) dependent widowed daughter and (ii) dependent LDD in Widow Pass with reference to the instructions contained in Board’s Ietter cited under reference. 2. It is observed that in the clarification issued vide Boards letter cited under reference, it has been stated that “ legally divorced daughter and Widowed daughter may be included in the PRCP as dependent relative of the retired railways servants, provided they reside with retired railway employees and subject to fulfilment of the income criteria laid down for the purpose” . The phraseology (i.e. as dependent relative); has created a doubt with" regard to inclusion of dependent LDD/widowed daughters in the Widow Pass as it gives an erroneous impression that they are to be treated as ‘dependent relative’. Moreover, no co-residency requirement has been stipulated in the pass rules but the same has also been incorporated in the said clarification. Widowed daughters provided they are ‘dependent’ on the railway servant. Legally divorced daughter who is ‘dependent’ on the railway servant. (ii) As far as PRCP is concerned, in terms of provisions (Col.3(i) of Schedule-IV), PRCPs can be issued to railway servants for self, wife/husband and children only, subject to the same conditions as applicable to railway servants in service. Accordingly, the aforementioned members of family i.e. dependent widowed daughters and dependent LDD are to be included in PRCP as children in view of the fact that they fall within the definition of “Family” as defined under Rule2(d) ibid. (iii) As far as Widow Pass is concerned, in, terms of, provisions (Col.3(ii) of Schedule-V), Widow pass can be issued on the same terms and conditions as are applicable to PriviIege Passes except that dependent relatives are not entitled to be included. Since, widowed daughters & LDD are not part of “dependent relatives”’, but rather part of “family”, they are entitled to be included in Widow Pass as family member as in the case if Privilege Pass. (iv) The word “dependent” has been used in Rule 2(d)(v) &2(d)(vi) of Railway Servants (Pass) Rules, 1986 (Second Edition-1993) w.r.t.-widowed daughters and LDD. However, the dependency criteria has been provided below the definition of “dependent relative” under Rule 2(c)(vii). The same definition for ‘dependency’ shall be followed for widowed daughters & LDD. 4. Keeping in view the statutory provisions, as contained in the Railway Servants (Pass) Rules, 1986 (second Edition-1993), it is now clarified that (i) dependent widowed daughters (ii) dependent LDD are eligible to be included in PRCP and the Widow Passes, provided they fulfil the income criteria of dependency stipulated in the proviso below Rule-2(c)(vii) of the aforesaid rules, as amended from time to time. The latest amendment to the said proviso, as contained in Advance Correction Slip No.75, Issued vide this office letter No.E(W)2016/PS5-1/7 dated 24.11.2016, may also be connected. Moreover, it may be noted that there is no requirement of co-residency of dependent widowed daughter/LDD with the PRCP/Widow Pass holder. 5. In View of foregoing, widowed daughters & LDD may be included in PROP/Widow Pass as eligible member of “family”, provided they are dependent on PRCP/Widow Pass holders, without insisting on co-residency criteria. 6. This issues with the approval of the Competent Authority and the concurrence of Finance Directorate of Ministry of Railways.